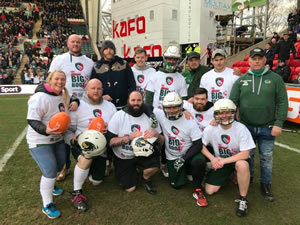 Players from the Leicester Falcons attempted a different sport on Saturday as they took on the Leicester Tigers ‘Big Boot’ challenge. The Falcons appeared on the Welford Road pitch at halftime of the Tigers’ game against Harlequins, attempting to catch ten cannon-fired high balls in an attempt to win £2000. The team, complete in pads and helmets, caught five balls, putting them in the top half of performances this season but short of the jackpot prize. It was a great day out for the team and succeeded in increasing the profile of the Falcons, with the season just weeks away.